SOLON – A perennial Big-School playoff qualifier, Solon again should be one of the top eight Division-I football teams, if not the top five, in the Cleveland area. Veteran coaches Jim McQuaide (head) and Thom McDaniels (offensive coordinator) will have the Comets ready for the season that begins in four weeks in another march toward the Region 1 tournament, perhaps the toughest at the big-school level, starting in Week 11. The 2009 season might just have been a prelude to what is to come this season. The Comets went undefeated through 12 weeks, suffering their only loss in the state quarterfinals. McQuaide has had many playoff and playoff contending teams here and at St. Edward in the 1990s, and McDaniels built many powerhouses at Canton McKinley and Warren Harding and most recently aided a consistently strong Massillon Jackson program. The Comets (5-0 in the Northeastern Ohio Conference Valley Division and 12-1 in ’09) will run out of its basic Multiple I on offense and 4-3 on defense. Although the Comets graduated four Student/Athletes in June who will be going on to college S/A careers in Div-I, Div-I-AA, or Div. II programs, they still have a wealth of talent returning to accomplish the mission they came short of by three weeks last year (go 15-0). The Comets, playoff qualifiers in 10 of the last 11 seasons, will be most experienced on the interior line, at running back and at linebacker. The big question marks are at quarterback and the defensive line. “We are going to need improvement very fast at QB and on the defensive line,” McQuaide said. One candidate for the starting quarterback is Chris Humphrey, who has had two good years for the Comets as a defensive back and whose brother, Mike, is a Division-I college track Student/Athlete at the University of South Carolina. In 2009, Chris Humphrey, who plays lacrosse in the spring, had 65 Tackles – 29 Solos / 35 Assists, 1 Tackle for Loss, two interceptions and one fumble recovery. He was also a starter on the varsity at free safety as a sophomore, registering 28 Tackles – 10 Solos / 17 Assists, one Tackle for Loss / and two fumble recoveries. On offense he has had 21 Carries for 252 yards and 2 TDs and on special teams 22 Punt Returns for 225 yards, and11 Kick Returns for 214 yards. If he does line up behind center, he will have the luxury of having fellow DB Kyle Hammonds back there with him. In ’09, Hammonds was a starter at tailback and earned First Team All League and Second Team All District. He had 254 Carries for 992 yards and 17 TDs and on the receiving end 22 catches for 313 yards and 2 TDs. In ’08, Hammonds, who also runs track, was also a starter at tailback, garnering First Team All League accolades and Honorable Mention All District. He had 154 Carries for 816 yards and 12 TDs, along with 15 Catches for 139 yards and 1 TD. As a kick returner, he’s picked up 183 yards. He has made oral commitment to accept football scholarship to Ohio University. The offensive line will be anchored by a trio of veterans in Nathan Hoff, Sam Camiener, and David Corrigan, who weigh a combined 750 pounds and are all over 6-feet tall. Hoff was a starter at defensive tackle and an alternate at OG in ‘09. Defensively, he had 48 Tackles – 8 Solos / 26 Assists and a whopping14 tackles for loss, better than one per game. In ‘08 her was also a starter at defensive tackle. A three-sport Student/Athlete, Hoff, a junior, also wrestles and throws the weights for the track and field team. Camiener, a hockey guy on the up and coming Solon iceman program, and Corrigan, a trackster in his spring life, return as the starting offensive guards. Also committed to OU verbally, Jovon Johnson leads the linebacker crew and will also see time in the offensive backfield Johnson is also a track person. Other returning starters (part or full time) and regular alternates for the Comets are Tres Barksdale (WR/DB - 6-2, 180, Jr., Basketball, Lacrosse, who was a starter at wide receiver and earned First Team All League honors via his 38 Catches for 578 yards and 5 TDs; Nick Davidson (LB/RB - 5-7, 170), a starter at linebacker where he registered, 78 Tackles – 16 Solos / 45 Assists, 17 Tackles for Loss (also better than one per game), one interception, and two fumble grabs; AJ Hicks (LB/TE - 6-1, 220, Sr, Track), an alternate at linebacker but with enough action to make 58 Tackles – 13 Solos / 38 Assists, 7 Tackles for Loss and grab 3 Interceptions1 opponent’s fumble; Christian Jackson (RB/DB - 5-11, 180, Sr, Basketball, Track), an alternate at tailback, from which he had 52 Carries for 199 yards and 5 TDs and out of the backfield, 9 Catches for 70 yards, as well as on STs, 4 Kick Returns for 103 yards; and Austin Stock (OT-C/DE - 6-4, 245, Jr.), who was an alternate at both offensive tackle and center. Hicks has has scholarship offers from Ball State University and Youngstown State University. New Orleans, La. – Recently graduated track star Clara Shaw and rising-senior Joanna Johnson were named to the U.S. Track & Field and Cross Country Coaches Association (USTFCCCA) All-Academic Team, the organization announced on Friday. 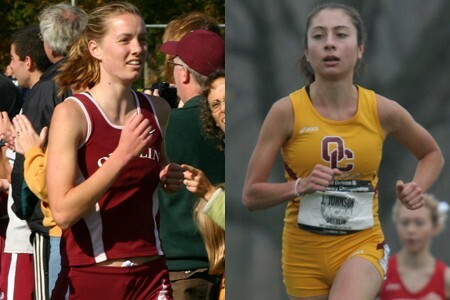 The duo, which helped lead Oberlin to second-place finishes at both the NCAC Indoor and Outdoor Championships this past season, were two of 330 Division III female athletes to earn the distinct recognition. The Yeowomen were surely missed Shaw’s talents during the 2010-11 season, but Johnson has already been training for the upcoming cross country season as she hopes to claim her third straight NCAA All-America award. AVON, Ohio - The Lake Erie Crushers snapped a six-game losing skid with a 3-1 victory over the Kalmazoo Kings Saturday night at All Pro Freight Stadium in front of a crowd of 3,574. The Kings opened the scoring in the top of the first without the aid of a hit against Lake Erie starter Matt Smith. J.J. Sferra and Eric Suttle drew leadoff walks and after a Matt Maloney groundout, Matt Greener's bouncer to short scored the opening run and gave Kalamazoo a 1-0 lead. Smith battled through five innings, allowing just the first inning run. He walked six and struck out a pair. Lake Erie had runners in the first two innings but failed to score until the fourth. Raphael Turner singled with one out and moved to second on an Andrew Davis grounder to second to set up Drew Saylor with two outs. Saylor delivered, grounding a single to left as Turner scampered home to even the score. Kalamazoo threatened in the seventh when Bryan Marquez led off with a double off of Jeff Cinadr. Jeff Helps sacrificed Marquez to third but Cinadr was able to escape unscathed, retiring Sferra on a groundout and striking out Eric Suttle to end the inning. The Crushers pulled ahead in the ensuing frame with a two-out strike against Kalamazoo starter Joe DiPietro, who threw a complete game but suffered his eighth loss of the season. Wayne Bond notched up his second infield single of the game before Arden McWilliams knocked a two-run homerun to left on the first pitch of his at bat to give the Crushers a 3-1 lead. The homer was his sixth on the year. Cinadr picked up his third victory for Lake Erie with three innings of scoreless relief. J.J. Pacella stranded the tying runs on base in the ninth to record his sixth save. Lake Erie managed 11 hits in the game. Jodam Rivera, Wayne Bond, and Arden McWilliams registered two hits each. The Crushers and Kings will square off again on Sunday in a 5:05pm start. RHP Alberto Rolon (2-2, 3.02) faces off against Kings RHP Guido Fonseca Jr. (1-5, 6.09) in game two of the three-game set as two converted relievers battle each other. NORTH RIDGEVILLE – The girls’ cross country team at North Ridgeville High will be both an experienced team and a young one since four of its top seven runners in 2009 were sophomores. Sam Rufener, now in his third season as head coach of the Rangers, has his core group of runners returning. Only Becca Lamb has graduated and will be running for Indiana Technical College as a Student/Athlete this fall. Among the top five runners returning, four are multiple-year varsity letter winners and three of those are juniors. Morgan Rogers is the only returning senior and will be looked on to for leadership (along with the experienced junior crew) as well as her running. Others returning in that core group are juniors Caitlyn Tipple, Kelsey Sikon, and Tessa Comnick, and sophomore Taylor Lowery, who earned a varsity letter as a freshman. Those also looking to break the top seven and if not aid on the JV unit include junior Melanie Smith, sophomore Holly Sapienza, and freshmen Leah Lindak, Arshiya Anand, and Deanna LaSalle. With only 10 runners on the roster, depth is an issue. Ridgeville is a D-I school in a D-II conference and then has to go into one of the toughest D-I district and region in the post season. Obviously, the health of each runner is of the upmost importance. Last year, the team had a definite leader in Becca Lamb, who was also one of the top bowlers in the school on the Ranger league championship team. She was a four year runner and regional qualifier, in addition to holding the school CC record. Still, the team runs well in packs and gets the collective high finishes at the big meets. The Rangers took 1st at the Patriot Invitational and 2nd at the Vermilion Invitational in ’09. Last year, every runner set a personal record. However, it just so happened that it was a one-at-a-time getting hot kind of thing, as each runner set her PR at a different race. Among the newcomers, Lindak is one that will most likely be a member of the varsity squad. As an 8th grader, she qualified for regional competition, in two events, at St. Richard’s Middle School, in North Olmsted. Although there are no changes on the girls’ side of the CC family in NRHS, Rachel Hill is taking over as boys’ head coach as a result of Kevin Drapcho’s retirement. In the West Shore Conference, Ridgeville did have a decent year, finishing in the middle, fifth, as a team, and claiming two of the top 20 runners individually. AVON—Avon’s Under-14 Youth Baseball Team won the Thurman Munson League by finishing tied for first place during the regular season followed up by the league tournament championship. Avon, coached by Pat Collins, finished the year with a record of 16-4. This same group won the state championship two summers ago and was a state qualifier last year. Collins decided that he would just keep it local this year by competing only in the league and going easy on the Student/Athletes for travel by foregoing the opportunities for state, regional and national play.